That is so adorable! They seem to be waiting for you to join them. 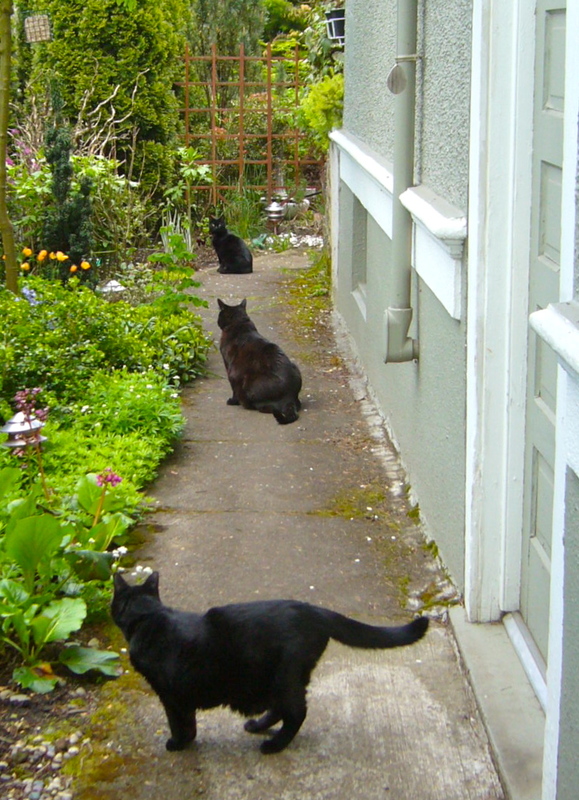 Sometimes I walk the kitties around the garden…they love it….and then they go on their way. Ooh a girl after my own heart! I love kitties. Two of my three are black also. And you know what else I see? A REALLY cool side garden. Yes, indeed. A girl after my own heart. Great photo! Kimmie, I am glad my cats didn't hear that but in a way they probably have all taken on the feel of their owners! Macavity, the nearest to the the camera, is our eldest cat. She is 14 and like me has allergies and asthma. She is a super smart cat and has a vocabulary recognition of about 8 or 9 words. She has horrible hips and keeps falling off things. Maurcie, the 19-pound cat in the middle, is my love bug. He's a lover not a fighter and has a thing for opera and the French language. He also has food insecurity issue. He is 10 now and is grumpy about it. Mona, the last cat, is our smallest cat. She was abandoned in a parking lot as a kitten and I found her one dark and rainy night when I went to Home Depot to buy something. She is half feral but a total sweetheart once she knows you. She is my husband's cat and she is about 4 or 5 now. Mona and Maurice are good friends and Macavity hates them both. When the females fight, Maurice actually gets between them. He likes them both, but Macavity still hates him. This photo opportunity occurred right after some foster children had left. The kids had been here for 4 days and the cats were ready to get back to the garden.